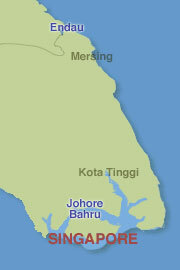 Mersing, 133Km north of Johor Bharu in Johor State, in the southern tip of peninsular Malaysia. It used to be a sleepy fishing village but now is also the main ferry point for trips to the holiday island of Pulau Tioman. There are still many fishing boats on the river, as well as a local wet market and fishing-related industries. The Endau river forms part of the boundary between the states of Johor and Pahang, and our fishing boat pictures were actually taken in Pahang. The Endau river also attained brief notoriety during World War II, when Japanese forces landed at the river’s mouth, then headed south through Mersing towards Singapore. They were ambushed 10 miles south of Mersing by an Australian battalion and 300 troops were killed.